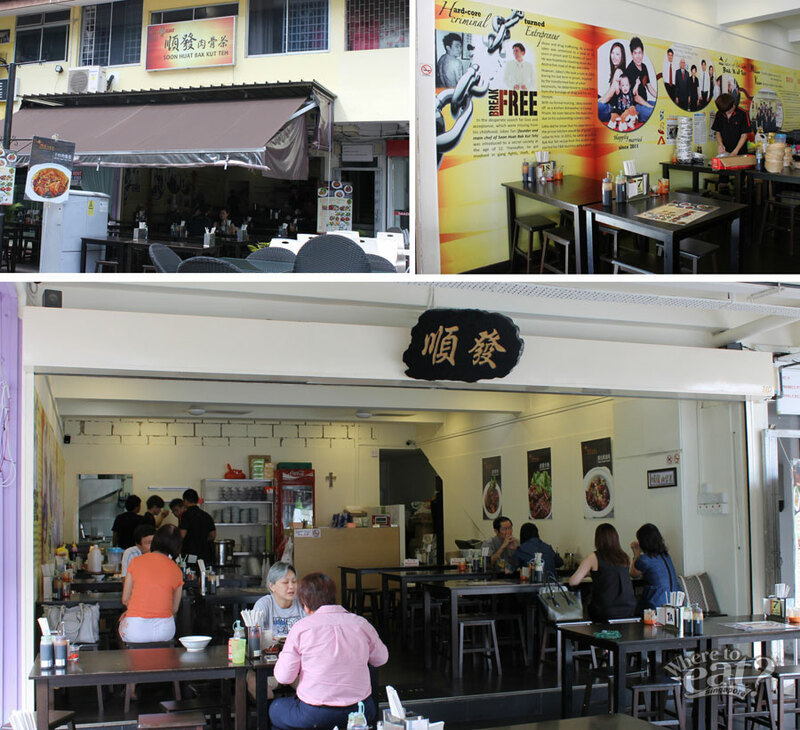 Formerly located at Jalan Kayu, Soon Huat Bak Kut Teh has since relocated at Simpang Bedok in April 2013, and opened a new outlet at 548 MacPherson in April 2014. Don’t confuse the relocated and new outlets with the one at Jalan Kayu though, as they do not operate under the same company – or for the same cause for matter of fact. Soon Huat Bak Kut Teh operates as a social enterprise, hiring ex-convicts who want a second chance in the professional industry. It was quite an enlivening experience having them serve you with the most genuine smile and enthusiasm. Social stigma aside, everyone is born with goodness in them, and we surely felt that goodness coming from the staff at Soon Huat Bak Kut Teh. Most importantly, its food do not disappoint too. Soon Huat Bak Kut Teh (1 Pax $5.90/2 Pax $11.80/4-5 Pax $23.90) replaces traditional pork ribs with Argentinian pork for more tender meat and less strong odour. The dish is mainly focused on retaining the natural sweetness of the pork, that is why its broth does not aim to mask but complement the succulent meat. 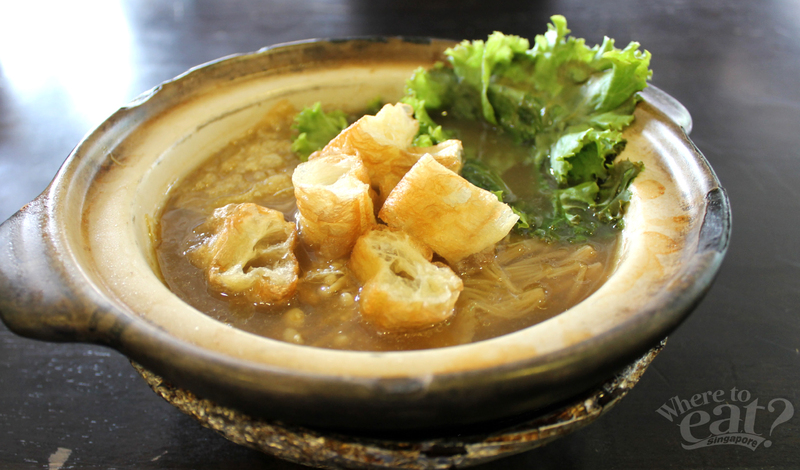 Mildly herbal with peppery hints, the broth successfully combines the characteristics of Malaysian and Singaporean bak kut teh in the most subtle manner, creating a taste that is unique to Soon Huat only. 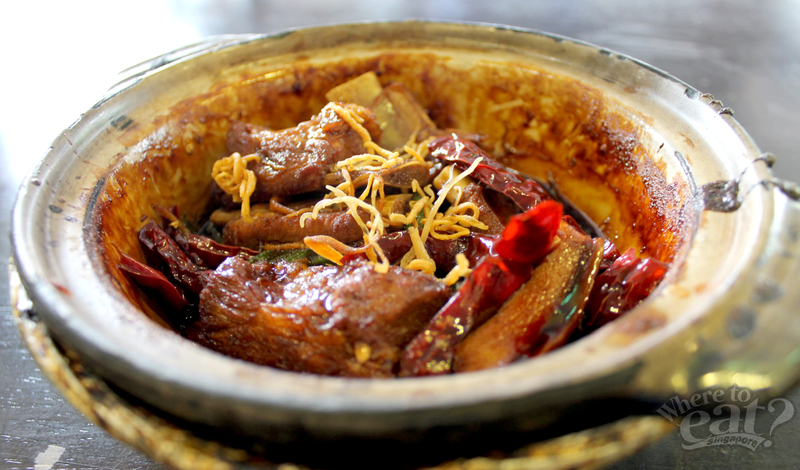 The pot also brimmed with pig liver, pig stomach, beancurd sheets and additional choice of golden mushrooms (Add $0.50). Soon Huat rendition of Dried Bak Kut Teh ($5.90) paired with rice is closely inspired by Ba Sheng Bak Kut Teh in Malaysia. It came served with Argentinian pork in broth, then boiled until the broth is reduced to a stock. The result was heavily infused and fragrant meat that retained its firmness but still tender inside. To suit the local palate, dried chilli was added for extra Oomph! Plus ladies fingers and crispy fried cuttlefish for extra crunch. 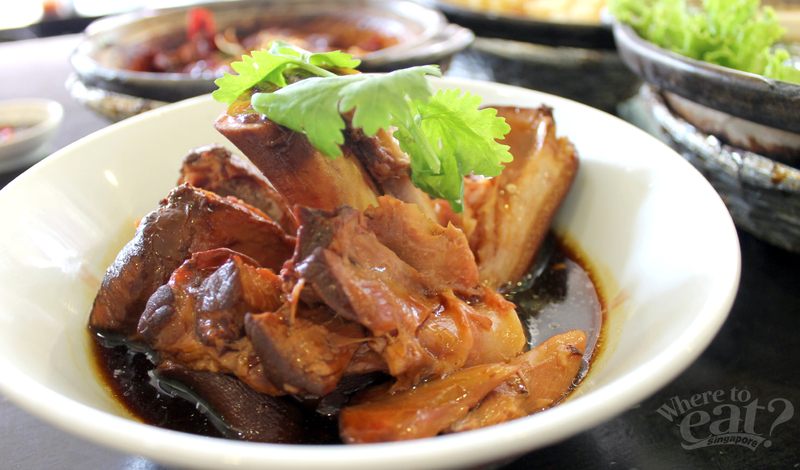 Pig knuckles were used in replacement of pig trotter in Braised Knuckles ($6.90) because it is less fatty, more juicy and more tender. The rich gravy emanates a slightly sourish but bright and appetising taste, which is apparently Soon Huat’s secret to luring in the lady customers. Somehow, sourish food always finds its way to a woman’s stomach, huh. Pair this with rice for a satisfying meal. For something lighter, try the Braised Tow Ki ($3.90). 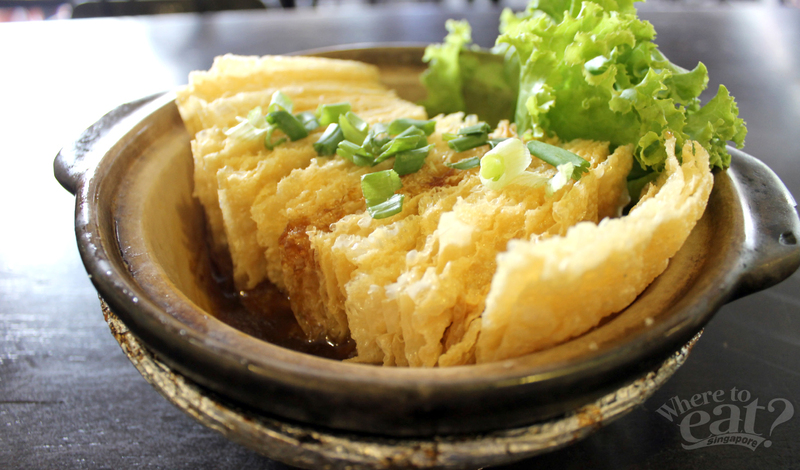 These crispy fried beancurd sheets are actually not braised, but served on a bed of braised sauce to dip. Perfect to share as an appetiser instead of having it as a main course. 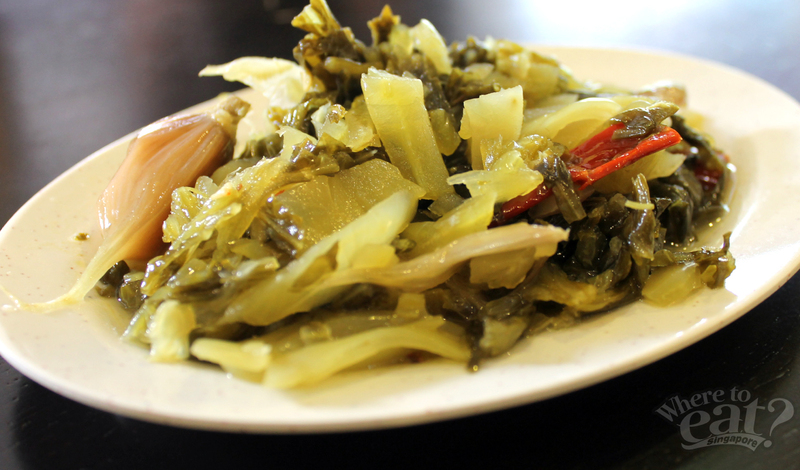 For side dishes, try the Salted Vegetable ($2) which is stir fried and slightly sweet to taste. Come here for the food and good cause, really. You will not only be physically satisfied, but also spiritually humbled. Unlike most social enterprises that are started by wealthy entrepreneurs, Soon Huat Bak Kut Teh was started by Jabez, an ex-convict himself. During his twelve years of imprisonment for gang fights and drug related offenses, he did dishwashing before becoming the main prison chef cooking meals for the inmates. It is through these second chances in prison and the grace of God that he found love for food and freedom. Soon Huat Bak Kut Teh helped us remember that while each individual is special in their own way, together they can create greater and more beautiful things. And while we complain about life struggles, there are many other people having it tougher than us. Yet they triumph over us because they take that second chance provided to them and make the best out of it. If we had to describe Jabez in five words – mad respect for this guy. Jabez is in the first row, second from the right.